Molluscum contagiosum is a viral infection which causes small flesh-colored bumps on the skin and typically affects children. 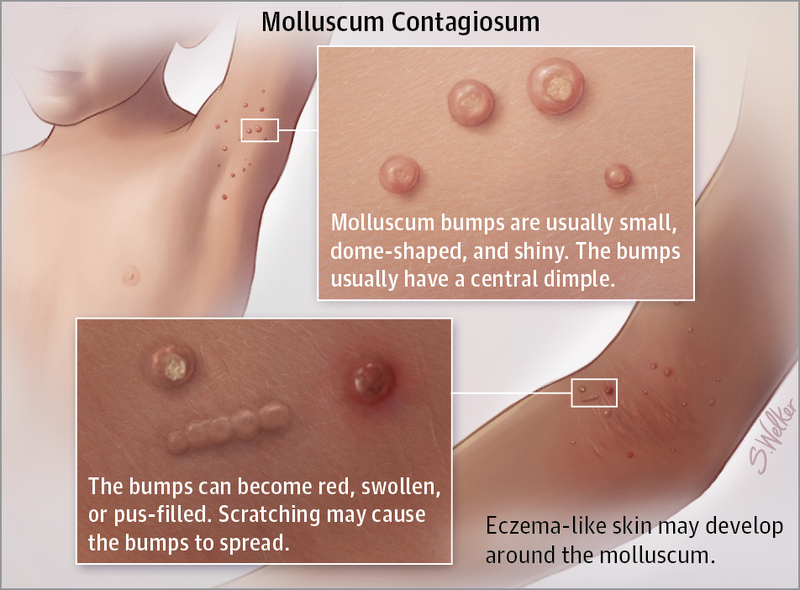 Though the infection is common, many misconceptions exist concerning the spread and treatment of Molluscum contagiosum. The accompanying article which recently appeared in the Journal of the American Medical Association is a useful and informative reference. If you or a family member have any questions or concerns after reading this piece, please contact our office. Use your new patient portal to communicate directly with your Peraza Dermatology Group provider* or call the office to setup an appointment. *If you haven’t setup your patient portal yet, you can do it in 3 easy steps. Start right now by emailing portal@perazaderm.com to request your login link or visiting the patient portal blog post with all the details about the new patient portal. This entry was posted in From the Doctors and tagged JAMA, Journal of the American Medical Association, molluscum contagiosum, patient portal, peraza dermatology group.